Click the image to be taken to the truthXchange website to order this book. A wonderful lady, Mary, who works at truthXchange was cut off driving on the freeway over a year ago. The person had one of those Coexist stickers on the back of his car… but then she noticed that it said something different – Contradict. She found my website and shared her ministry with me. TruthXchange was new to me. I had never heard of its founder, Dr. Jones before either. Mary sent me a copy of Only Two Religions. It’s a user’s guide to the truthXchange Evangelism Tool. She asked if I could read it and give some feedback. I finally finished reading it in Dec. 2013, long after receiving it, and I’m just now getting to write something about it. One-ism, all is one. We worship and serve creation as divine. All distinctions must be eliminated. Through enlightenment, we discover that we also are divine. Two-ism, all is two. We worship and serve the eternal personal Creator of all things. God alone is divine and is distinct from His creation, yet through His Son, Jesus, He is in loving communion with it. The book addresses the topics of humanity, religions, our problem as humans, and the solution to that problem from both a one-ist view of the world and a two-ist view of the world. Each section is designed to be read as a group with assignments to do during the week – pretty cool stuff, like looking for one-ist articles and movies to share with the group at the next meeting. This framework comes from Romans 1:18-25. This section of scripture states very plainly that all of creation knows there is a God from what has been created, yet men, have exchanged the truth of God for a lie, and have instead worshiped and served created things, rather than the Creator – who is forever praised. When the Creator God is denied, men still worship. The Created becomes the object of worship – creation, nature, is now One, not Two. When the Creator is not exchanged for a lie, there are Two – Creator and His creation. This means there are only two religions – worshiping the Creator or worshiping creation. Dr. Peter Jones explains that “One-ism can be either atheistic (God is nothing and nowhere), or pantheistic (God is everything and everywhere)” (page 9). From either form of One-ism, mankind’s ultimate problem is that we don’t recognize this all pervasive oneness. One-ism says that our solution is to turn inward to ourselves – to become enlightened, that together, not separate, we can solve all of our problems. Either way – atheistic or pantheistic, this is humanism, mankind is now divine. This is a good starting point for discussing the uniqueness of the Christian truth-claims amongst the world’s religions. Christianity after all is the turning from one’s self (one-ism) and turning to Christ for salvation (two-ism). Is the Jewish God personal? Well, yes it would seem so. The Old Testament speaks often of God’s love, His compassion and His grace. Such attributes are indeed personal. And yet, the same Old Testament Scriptures give hints that God is triune. The first verses of the Old Testament include the hovering of the Spirit, the power of the Word, and the intentions of God the Creator. (See also Genesis 1:26 and other plural references for God, Psalms 110 and other passages that clearly speak of the coming Messiah). We also see that the Messiah must be God himself. (Isaiah 58). Essentially, I understand Dr. Jones to be staying that sense the Jews have rejected the God revealed in the Tanakh (the Old Testament) they have rejected the Creator and are now “functioning as One-ist (page 58). The same explanation also applies to Muslims with their view of Allah, who though He is viewed as transcendent and the Creator of all, “is made out to be so transcendent that no one can actually know anything about him” (page 59). 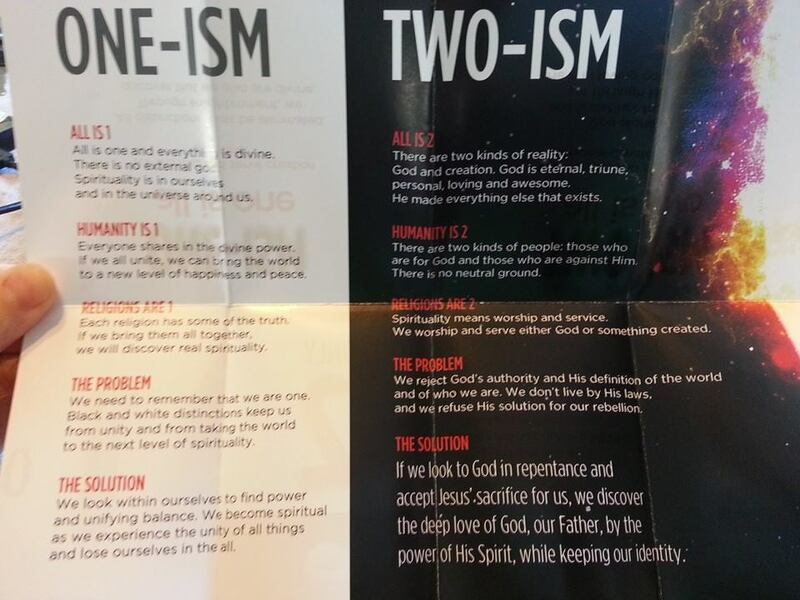 This is the inside of the unfolded truthXchange “Only 2 Religions” evangelism tool. Note, they don’t call it a tract. Because of this hiccup on Judaism and Islam essentially claiming to be Two-ist, I personally don’t like this One-ist and Two-ist framework to say that there are only two religions. That doesn’t mean I don’t like this framework though. I was able to use this framework to explain patterns of religions with a man on plane a ride this past winter. I pulled out the truthXchange “Only 2 Religions” evangelism tool to show the difference between religious pluralism/pantheism/New Age/Hindu thought and practice compared to Christianity. We went through each of the topics listed in the tool from the “All is One” perspective and the “All is Two” perspective. Having the tool in my pocket was very useful and gave a good visual to our discussion. I then was able to share Romans 1:18-25 to clarify that we all know there is a God from what he has made and that we all worship, we just don’t all worship the one true and living God. I stressed that we all know there is a God even if we have exchanged that truth for a lie, and that it is through the person of Jesus Christ that the one true God has been personally revealed to us, that Jesus is the invisible image of God made visible to us! I also like to classify religions as either, “from man” or “from God.” All religions besides Christianity were founded by men, who claimed to be men. They were either heroes, sages, prophets, or the like, but only in Christianity do we get a religion that is founded by a man who claimed to be God in the flesh. This is why it should be no surprise that Christianity is the only religion that is “paid” for us by God. So please, whatever way you want to share it – “One-ism vs. Two-ism” or “Paid vs. Not Paid” or “From Man vs. From God” or through none of these categorical tools- proclaim the Good News that salvation has come to us through the person and work of Jesus Christ. Do not be ashamed – Romans 1:16. Click here for Only 2 Religions. Click here to get my book, Contradict – They Can’t All Be True. Previous Post Is Atheism a religion? Next Post Do Christians and Muslims worship the same God? I did like your “2 religions, either “paid” or “not paid.” I think Martin Luther would have liked that too (although it doesn’t capture the stifling, aching emptiness of nihilistic atheism – believe me, I have been there).